Perhaps only the ultimate Mets diehards remember Dean Chance wearing the New York pinstripes. He donned that uniform just in time for his final Topps card, part of the venerable 1971 set. Actually, I seriously doubt that he’s even wearing Mets pinstripes in this photograph. He pitched only three games for the Mets at the back end of the 1970 season, having joined the team in a waiver transaction with the Indians. It’s more likely that he is wearing the pinstripes of the Indians, or perhaps even the Twins, with the Mets’ blue colors airbrushed onto his cap and distinctive turtleneck jersey. Chance entered my consciousness last weekend when he threw out the ceremonial first pitch before the opening game of the Angels’ series against the Yankees. The Angels are doing something legitimately commendable: In honor of the 50th anniversary of the franchise, the team is having one of its former players throw out the first pitch before each of its 81 home games. A nice touch. The Angels should remember Chance. Early in his career, Chance emerged as the first pitching star in team history, at a time when the franchise was known simply as the Los Angeles Angels (and not the ludicrous Los Angeles Angels of Anaheim). In 1964, the fourth year for the expansion Angels, the powerhouse right hander won the Cy Young Award, which was not yet divided between the two leagues. With only one award up for grabs, Chance defeated the legendary Sandy Koufax, among other American and National League pitchers, for the prestigious honor. Chance deserved it, too. He completely dominated hitters that season, posting a record of 20-9 with 11 shutouts, and a league-leading 1.65 ERA, while tipping the 200-strikeout mark. He particularly put the hex on the Yankees, defeating the American League champions four times without a loss. A power pitcher at 6-foot-3 and 230 pounds, Chance used his good fastball and sinker to tame AL hitters, but supplemented the hard stuff with his newly refined slider and a deceptive sidearm curveball. That slider, along with an unusual pitching motion, contributed to his success. Once Chance received the sign from his catcher and initiated his windup, he turned his back completely toward home plate, temporarily hiding the ball from the batter’s view. In so doing, Chance lost sight of his target. He then spun around, barely picking up the catcher’s target before releasing the pitch. Just as importantly, the motion provided a disconcerting moment to the hitter, who wondered whether Chance looked at home plate at all before making the pitch. Chance’s unorthodox motion also contributed to his frequent wildness, which made hitters even more unsettled. Equipped with his against-the-grain delivery and powerful arsenal, Chance remained an effective pitcher through the 1966 season. But arm trouble, specifically tendinitis in his pitching shoulder, took a toll. Now featuring a reduced fastball, Chance saw his strikeout totals fall below 200 for two consecutive seasons. No longer a dominant pitcher, Chance fell from staff ace to No. 3 starter. Off the field, Chance became friends with the equally colorful Bo Belinsky, a fellow member of the Angels’ rotation. The two young pitchers joyfully participated in the blurred nightlife of Los Angeles, making the rounds at various nightclubs and dance halls. While closing bars throughout Hollywood, Chance made friends with some of the entertainment world’s most notable partiers, including Ann-Margret, Mamie Van Doren and a fellow named Hugh Hefner. For a guy like Chance, who wanted nothing more badly than to be famous and recognizable, it was an ideal lifestyle in the fast lane. Conversely, Chance didn’t particularly relish life with the Angels, in large part because he wanted to win and felt unsatisfied playing with a second-rate ballclub. He sometimes criticized his teammates for their poor play behind him in the field, a trait that did not make him Mr. Popularity in the clubhouse. Chance even devised a scheme to get himself ridden out of town. He repeatedly fabricated trade rumors involving himself, often linking his name with blockbuster deals that would send him to contending clubs in exchange for All-Star talent. Perhaps the Angels finally started to pay attention to Chance’s proposed “trades.” Convinced that he would never again reach his peak of 1964, the Angels traded Chance in December of 1966. They sent him to the Twins for a package of three players: power-hitting first baseman Don Mincher, outfielder Jimmie Hall and non-descript pitcher Pete Cimino. Chance made major improvements with the Twins, lowering his ERA from 3.08 to 2.73 while logging 283 innings, even more frames than he had pitched during his workhorse days in Southern California. Chance’s 1967 season peaked on Aug. 25, when he pitched a no-hitter against the Indians. 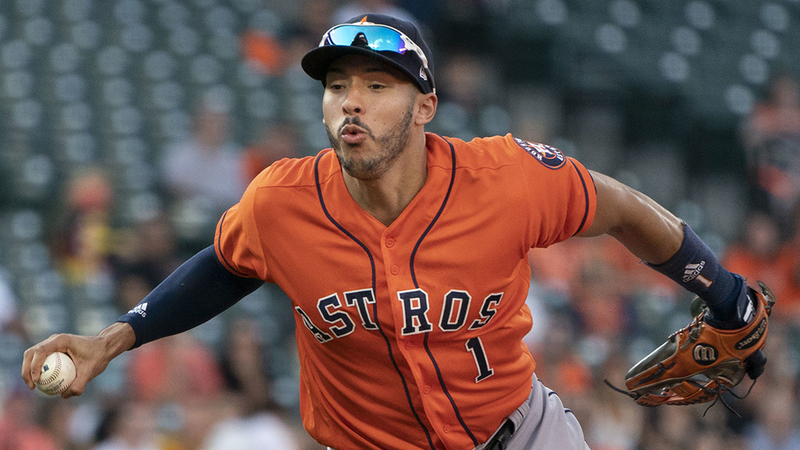 With that game garnering headlines and the rest of his season bulking up his resume, Chance earned American League Comeback Player of the Year honors from The Sporting News. Yet, the Twins had still not seen the best of Chance. He pitched even more efficiently in 1968, lowering his ERA to 2.53 and increasing his innings total to a career high of 292, all the while enjoying the benefits of the Year of the Pitcher. But the Twins didn’t score many runs for him, saddling him with a 16-16 record when he easily could have won 20 games with a mild dose of offensive support. The 1968 season represented the last hurrah for Chance, whose iron man workload finally took a more permanent toll in 1969. Arm injuries limited him to 20 games, clamping his innings total at well under 100, the lowest output of his career since 1961. The following year, Chance’s ERA soared into the 4.00 range, prompting a late-season trade to the Mets. After being clubbed in a three-game cameo for manager Gil Hodges, Chance continued to struggle during spring training of 1971. On March 31, the Mets traded him and pitcher Bill Denehy to the Tigers for fellow pitcher Jerry Robertson. Chance lasted the entire season in the Motor City, but pitched mediocre ball as a combination starter/reliever, and was released at season’s end. His baseball days at a close, Chance left an interesting legacy—as a hitter. In 662 at-bats, he managed a mere 44 hits, good for an .066 batting average. Along with reliever Ron Herbel and starter Bob Buhl, Chance reigned as one of the worst hitting pitchers of his era. When Chance’s journeyman playing career ended in the winter of 1971, he chose not to remain in baseball. He became a boxing manager and promoter, something he had dabbled in during the winter months of his baseball career. Chance served as the manager for heavyweight boxer Earnie Shavers, who once fought and lost a tough unanimous decision to Muhammad Ali. Shavers became successful in the heavyweight division, but Chance continually lost money in the boxing game and eventually left the sport. Chance considered becoming an actor—in fact, some friends encouraged him to pursue a career in Hollywood—but he didn’t have the patience to sit in casting offices auditioning for parts and waiting for calls that might never come. So Chance joined a traveling carnival, simply because he was not trained to do anything else. He became a carnival barker who specialized in running one of those games in which participants had three chances to knock down two wooden clowns and win a stuffed animal. All the while, Chance traveled with fat ladies, midgets, gypsies and other curiosities. It may have been the most fitting job that an offbeat ballplayer like Chance has ever undertaken. Chance had financial success with the carnival, but the lifestyle wore him down. He also hated dealing with the many con men who infected the carnival business. Ultimately, Chance found happiness by returning to boxing. In the 1990s, he established the International Boxing Association, eventually becoming the president of the organization. It is a position that he still holds to this day, making him as well-connected in boxing as he was in baseball. Now 70, Chance has found long-term success in the boxing business where it eluded him in the mercurial world of baseball and pitching. But they still remember him well enough in Angels circles to have brought him back for a ceremonial first pitch. At a time when we hear so many sad stories of old-time players falling on hard times, it’s nice to hear about a happy result for a colorful character like Dean Chance. Actually,I think this photo is genuine. That’s definitely Shea Stadium, with it’s distinctive rainbow seating, in the background. Plus,you can see the orange top corner of the “T” in the Mets script name under the last “C” in Chance’s autograph. Since Topps had their headquarters in Brooklyn, it’s possible one of their photographers happened to be at Shea when Chance was. You may be right, Michael. It does look like Shea Stadium, now that you mention it. The only thing that has me wondering is the angle of the upturned cap, which obscures the logo. But it does look like the Mets’ blue. 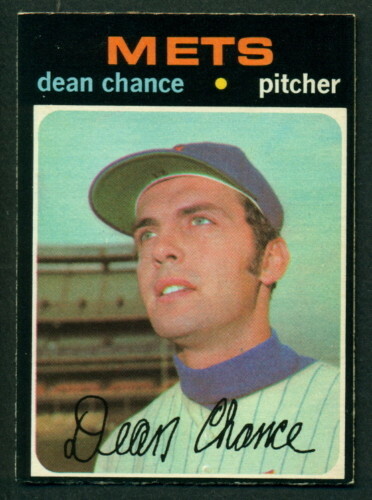 made as much sense for the Mets to get Dean Chance as it did to get Mickey Lolich for 1976..